The issue with VR is not so much about the limitations of the current state of technology, but the change it requires with our visual story telling “toolbox”. It takes away the power & grammar of Shot Framing/Editing, and clear story communication becomes more nebulous in exchange for gaining interactivity & world immersion. 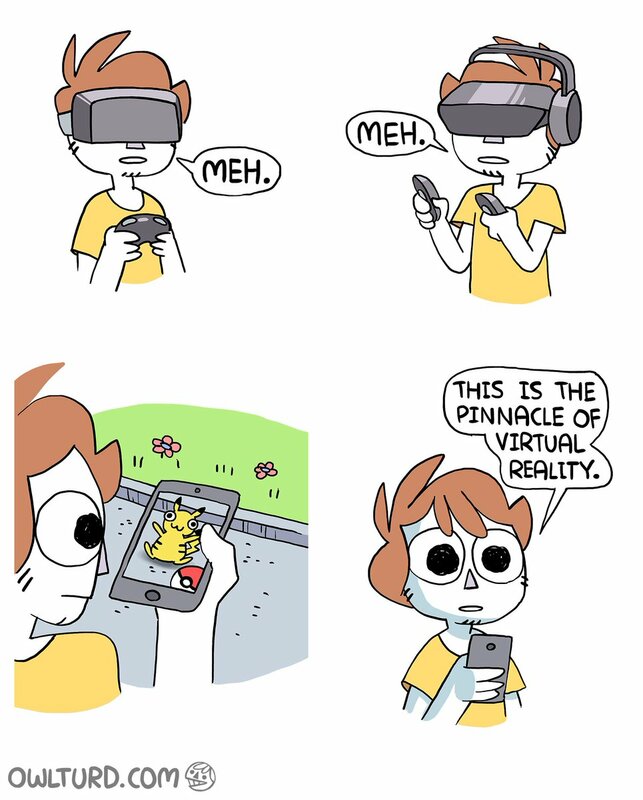 Looking at the Pokémon Go mobile game when compared to current VR headsets, illustrated here by “Shen” AKA Shenanigansen, explains the power of simplicity and using the context of a reality overlay to create viewer focus on the content/the Pokémon, rather than constructing, animating & composing an entire visual world inside a VR headset, and somehow expecting an “untethered viewer” to then follow along ”“as directed” with their participation. Games give the choice of direction & participation over to the viewer, and work around that, so exploring a game feels more natural. Whereas if you entirely throw out the concept & power that comes from editing & framing shots in exchange for a full VR world with all 360 degrees, then you’re also sort of cutting off the right arm of your directorial staging & story telling powers & tools. What weird hybrid mechanised tentacle arm VR may or may not be able to replace this loss with is anyone's guess at this stage. And I’m sure teams of people are working on it at this very moment, as well as the nausea associated with total immersive VR. So like the old sailor stories about approaching the unknown, "here be treasure & monsters abound with future VR. But working with film & images to tell a story & communicate with others, I say long live the power of clear editing & composition.. I watched a video on Channel Awesome which has a solution to VR nausea. The trick is to make the screen cover most of your visual field but not all of it. That way you can look off the edge which keeps you from getting dizzy. I'd say that's not necessarily the most ideal solution but it's the best one I've heard yet.